Why I like my F28/2.8 so much - its really a street lens! Interesting game. I really like the background in the last shot. thanks. 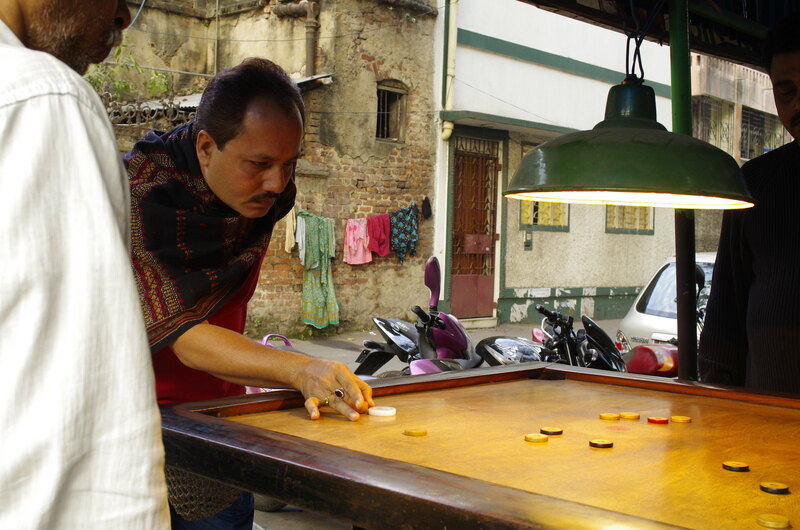 In some parts of Kolkata (formerly Calcutta), its still like in the old days in Havana - people hang out in the evenings around a makeshift canopy to play carrom (only played in Asia) and gossip (known as adda). 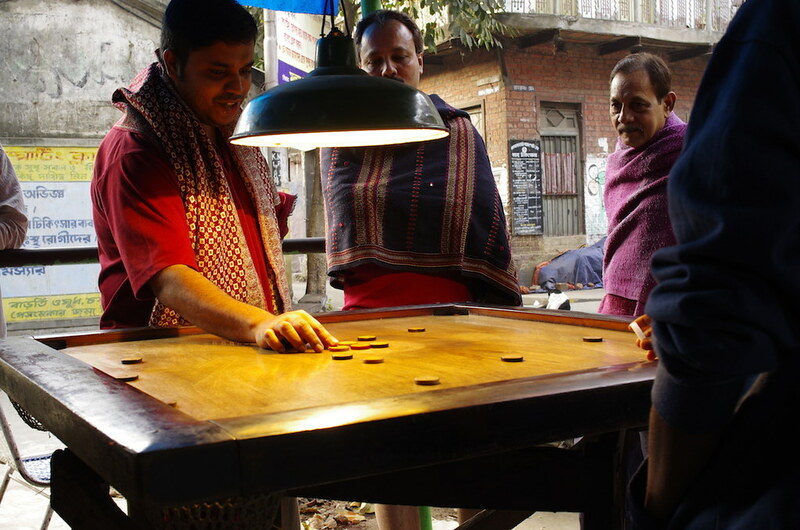 Deb, beautiful documentation of street life, a game of carrom and adda bazi. The Pentax F 28/2.8 lens is a winner - a true street lens on an APS-C camera. Though Westerners like the dilapidated look of our gallis and slums as they look unique to them, I think you could have softened the background. Look how Mr. Slowpez's eyes were drawn straight to the background rather than the prime photo theme - folks enjoying a game around a carrom board - a game popular in Indian streets. I would have used f 2.8 or 3.5 and lowered the ISO from 800, for a much greater noise control. You are perfectly spot on about Havana and Cuba's run down decrepit look. But it has some old European Spanish beauty there too. We were in Cuba last December. It is unfortunate that India's poverty, the decay and slums sell more in the West than our cultural richness, the warmth of our people as an ancient race, rather than the richness of India today as a world power far larger and powerful than many European or American nation. Thanks eaglem. Glad you liked it. 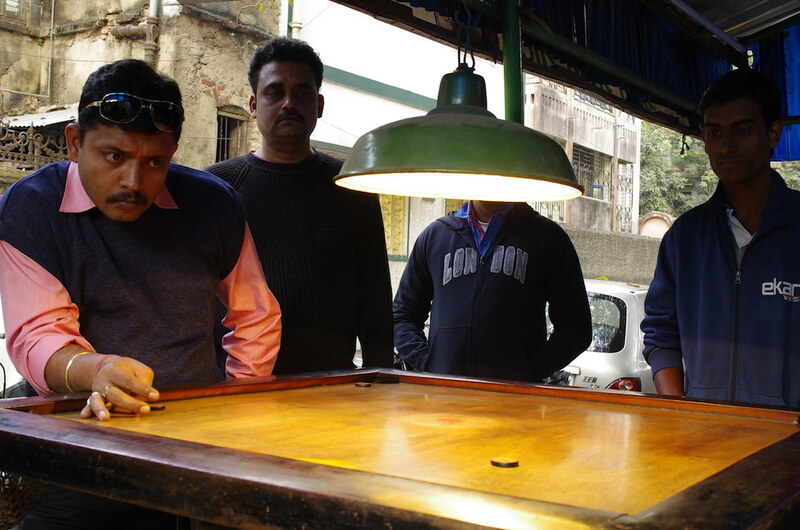 Deb, beautiful documentation of street life, a game of carrom and adda bazi. Thank you nanhi for your succinct comment. The media of Developed Countries have long monopolised the use of poverty images of Developing Countries to create a stereotype that continues to endure - and made palatable with the bogus logic of romanticism (the favelas of Rio is another example). This is all the more regrettable, because they have conveniently forgotten their Dickensian roots of the ravaged landscape of the Industrial Revolution. I can go on and on, on this topic but put in perspective, Westerners must be quickly forgiven - for they have repeatedly ignored history and have always failed to learn from their mistakes (look at the Vietnam-Iraq-Afganisthan debacle, the inequality debate in the US, or the current undercurrent of surging right wing nationalism in the European Union and it begs the question: wasn’t it always like this?). Political polemics aside, I love my copy of the F28/2.8. BTW I wanted to depict this as a street scene (environmental), so F8 was a conscious decision. Had I softened the background this shot could have easily have been placed outside its context. At the time I was carrying the F28 and the VL58/1.4 Nokton. Winter evening light was fading fast and I was kind of stuck with odd angles just to find enough light too see the faces clearly, so using the AF was critical too. Perhaps I should revisit the scene and carry my tripod, now that I am in Kolkata again. So Deb, here are some photos from Cuba. Do note I have not shown the poverty, or the open drains and some of the decrepit life style or the run down homes. Instead I choose to show Cuba's beautiful Spanish & European past as I saw it. And the folks are great mechanics too, having maintained their vintage cars to perfection post the US embargo. We were welcomed to Cuba as Canadians, and felt safe every where we went. What a merry band of people even in their poverty! Photo 4949 has a special significance. I asked our part time Guide - actually a Professor earning just $ 26 a month - where are the Natives (the ethnic people). He said the Spaniards killed them, and what few remained died of disease & poverty. So he took us to a mighty Church in Havana and showed us this statue. That little boy is the real Cuban native. nanhi, thanks for the photos of Cuba - stunning I might add. Actually I have no issues with showing life as it is warts and all, if need be. But romanticising poverty or any human defects are quite another matter as they enter the realm of propaganda (à la Herman & Chomsky). Then again, photography has struggled to become a Fine Art - and when I contemplate this several correlated topics occupy my mind - but I wont go into that. These aren't the greatest photographs and I am no fine art photographer. I came, I saw, I shot - lets put it to rest there. Thanks for your input though.